18.3 Mega-Ohm-Syndrome. Some people will say I need 18.3 Mega-ohm system and usually that is the extent of their specifications. DI water can be very simple or very complex. For a small flow, city water tied to 2 mixed resin bottles in series will generally give you 18.3 mega-ohms. On the other hand DI water systems used or DRAM semiconductor memory can cost millions of dollars. Do I need R/O System? Yes you do. What is a R/O System anyway? It is reverse osmosis. But what is reverse about water flowing thru membrane? Well, if you have a membrane, which will not let impurities pass thru, then the natural tendency for the water is to flow from cleaner side to dirtier side. But, we want it to flow from dirtier side (city water) to cleaner side. That is why it is called Reverse Osmosis. Do I need carbon bottles? Yes you do. Carbon takes out hydrocarbons, and more importantly, it takes out Chlorine, which is added by the municipalities as a disinfectant. If not removed, Chlorine will eventually eat up R/O membranes. 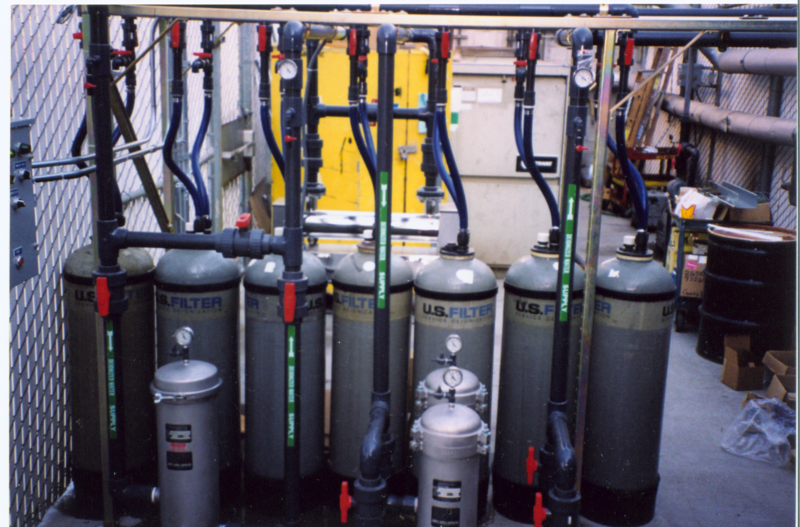 Chlorine doesn't attach well to the Carbon, but there it is the easiest way for small systems. Why do we need high pressure for R/O System? Theoretically it doesn't take much pressure to flow thru membrane. You can buy a small R/O System from Home Depot, which sits under your kitchen sink and generates R/O water with city pressure of approximately 30 Psi. But in Industrial applications, we don't want to wait around several hours to make a few gallons of water. Pressure is required to speed up the process. 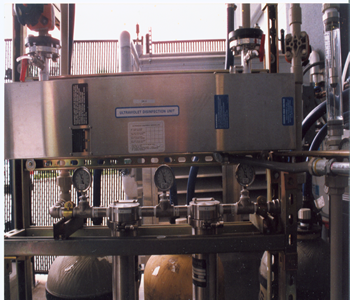 Typically small R/O machines will operate at around 200 Psi. Cost of R/O water? Mainly it is the power consumption for the high-pressure pump and the water itself. When maintained properly, the R/O membranes usually last a long time. 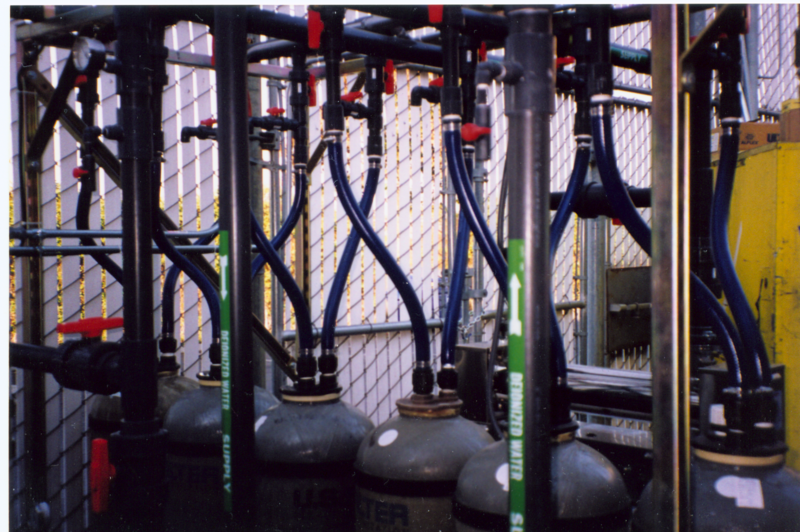 The cost of membranes, when amortized over their lives, does not add significantly to the cost of a gallon of R/O water. Why do we use R/O System if mixed beds bottles can give us 18.3 Meg water? Basically it is a cost issue. Sure, the mixed beds can take out all the ions and give you 18.3 meg-ohm water, but it is cheaper to remove ions thru R/O System, which can remove 90% of ions at a fraction of a cost. The remaining 10% of the ions are still removed by the mixed beds bottles. What makes DI Water system more expensive? If you have specifications for the following items, then you may be looking at a more sophisticated system. ©2004, Pascal Engineering, Inc. All rights reserved.